At 81 years, in Revere, on February 4th, following a lengthy illness. 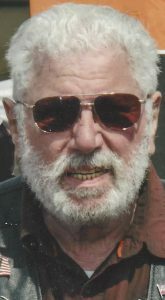 Husband of the late Bette I. (Davis) Gigliello. Devoted father of James Anthony Gigliello & his wife Donna of Revere, Gina Marie DeBiase of Meredith, NH, Darlene A. Giello & Annmarie Villante, both of Revere, Christie L. Gigliello of Palm Bay, Florida & the late Denise Gigliello. Dear brother of Rosalie Moccia & husband Robert Moccia, Sr. of Saugus, Lucille Gigliello of Revere & the late Paul V. Gigliello & the late Joanne Esposito. Also lovingly survived by 10 grandchildren, 11 great grandchildren & many nieces & nephews. Family & friends are invited to attend a visitation on Saturday, February 9th in the Vertuccio & Smith, Home for Funerals, 773 Broadway (Rte. 107) REVERE from 2:00 p.m. to 4:00 p.m. and followed by the Funeral Service in the funeral home at 4:15 p.m. Parking available left of the funeral home. Interment is private. U.S. Marine Veteran of the Korean Conflict. Longtime true & proud member of the 4th Degree Black Belt Yondan Uechi Rye Inter. Karate-Do Assoc. & recipient of their lifetime achievement award. Member of the Boston Chapter Harley Owners Group & Inter. Union of Painters & Allied Trades – Local #402. Former member of the Revere Loyal Order of the Moose #1272. Saturday, February 9th from 2:00 p.m. to 4:00 p.m. In lieu of flowers, remembrances may be made to St. Jude Children’s Research Hospital, 501 St. Jude Pl., Memphis, TN 38105-9959. I’m sending Heartfelt Condolensces to you and your Family. Praying for Peace & Comfort during this difficult time. I wish the Gigliello family my deepest heart felt sympathy on the loss of Uncle Nick! I wish him eternal peace and happiness. He was a beloved member of the Boston HOG chapter. We will all miss him dearly. My thoughts and prayers are with you during this most difficult time.